I am writing, not as a teacher or educator, but as a mere “passer-by” who is awestruck at the simple yet powerful demonstration and learning tool you have created about evolution. What a remarkable thing you have assembled! Having what I believe to be a firm grasp of evolution, and understanding the difficulties involved with explaining it in a concise and understandable way to others, I am ecstatic at having discovered such an immensely useful resource. I can’t tell you how impressed I am with the manner and non-technical tone in which you have produced such a wide review of evolutionary theory. It’s truly fantastic and deserving of a wider audience. I only wish I could be so succinct and capable with my own words and explanations. Now I don’t need to worry about such things! All I have to do is pass along: http://evolution.berkeley.edu/evosite/. Brilliant! Thanks for your time, D.W. The UCMP MIOMAP website was featured in the July 22 issue of Science’s Netwatch. MIOMAP is an on-line research database of Oligocene and Miocene mammal occurrences and related information that facilitates a host of paleoecological and evolutionary research. The Paleontology Portal was awarded the best academic website for 2005 by the Geoscience Information Society. Evolution.berkeley.edu has a new look! Evo in the News!, posted on the home-page, highlights the role of evolution in current science research that may be of interest to the general public. You can now browse all of our content by topic or use a search form. And finally, we’ve added many links to valuable articles on other websites, reviewing what’s out there and posting only the very best. Big Dinos Return—12:00 am, Lawrence Hall of Science. Find out what UC Berkeley and other paleontologists have discovered recently about dinosaurs and enjoy the robotic dinosaur exhibit and a variety of dinosaur-related activities. The smallest Triceratops skull known: New observations on horned dinosaur growth and behavior—7:30 pm, Lawrence Hall of Science. A talk by Mark Goodwin. How did Triceratops grow its horns and what did it use them for? Recent discoveries by UCMP paleontologists have resulted in new interpretations regarding the behavior and growth of horned dinosaurs, known to scientists as ceratopsians. On-line registration required. Carving your Thanksgiving Dinosaur—2:00 pm, Lawrence Hall of Science. What do dinosaurs and turkeys have in common? Find out as UCMP paleontologist Matt Wedel carves up a Thanksgiving dinosaur. California on Shaky Ground—The UCMP short course moves to February with a look at the seismology that has shaped our state and the upcoming events to commemorate the 1906 Centennial. For more details on all of these events, visit our UCMP calendar of events. 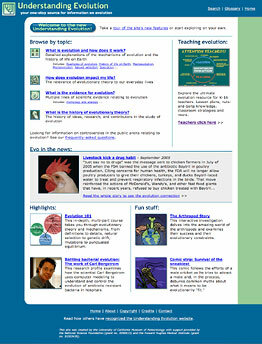 The new look of the Understanding Evolution home page.